Drive through Cincinnati, and it’s a mix of posh Mt. Adams and Hyde Park, old money homes in Clifton, and Walnut Hills blocks in transition, but also abandoned buildings in Lower Price Hill, street-side teddy bears marking the locations of shootings. It’s a city with nine Fortune 500 headquarters, but, according to U.S. Census data released in September, childhood poverty rates here are near the highest they’ve ever been. Half of all city kids under age 5 live in poverty. Half. Infant mortality in Hamilton County is down 15% over the last five years, equivalent to 88 children’s lives. What does it mean to grow up poor in Cincinnati? In 2011, Hamilton County had the second highest infant mortality rate of any urban county nationally. According to Cincinnati Health Department data, life expectancy in North Avondale, with a median income of $47,465, is between 83.3 and 87.8 years old; in Avondale, just blocks away, with a median income of $18,120, it’s 66.4 to 69.8 years. In recent years, a batch of programs have erupted in Cincinnati aimed at alleviating the symptoms of childhood poverty and at pulling families out of poverty—with some notable successes. In the last five years, the county has seen a 15 percent decrease in infant deaths, equivalent to 88 children’s lives, thanks in large part to Cradle Cincinnati and coordinated efforts among the region’s hospitals, community health workers, and parents. Despite this improvement, the infant mortality rate remains in the worst 10 percent nationally. There have been other signs of improvement for area children. With passage of the Preschool Promise levy, 1,351 additional Cincinnati children were enrolled in preschools and receiving tuition assistance this fall, with five more high-quality preschools now open. The “promise” was to create a more equitable start for low-income kids and, eventually, a more competitive workforce for the region. Despite so much time and money put into alleviating the health and educational side effects of poverty in recent years, seeing the depth of poverty increasing can make these efforts feel Sisyphean. Individual success stories touted across the city may pale in light of deepening income disparity—unless it’s your kid who was helped. Then all those efforts are exactly what you need. Cradle Cincinnati Executive Director Ryan Adcock, at the podium in a blue suit, joined Hamilton County and Cincinnati officials and health care partners in June to discuss the organization’s strategic plan. Adcock, who was plucked from Cincinnati city government to pull together Cradle Cincinnati’s first partnerships, is a soft-hearted wonk who mingles discussion of the soul-wrenching nature of his work with data. Lots of data. He tells me Hamilton County’s infant mortality rate is improving twice as fast as the state or the U.S. as a whole, and Cincinnati’s is improving faster than Ohio’s five other big cities. Regionally, smoking during pregnancy is down 19 percent, thanks to an abundance of local partners and the work of many moms to quit. The numbers are important. Part of the work has been correcting misperceptions. Many people previously approached infant mortality assuming it was a result of inexperienced teen mothers or that mothers generally were at fault. In fact, in Hamilton County the average age of a mother who loses a baby is 28 and the mother is virtually never to blame, says Adcock. The three main causes of infant death are birth defects, sleep-related deaths, and preterm birth. Birth defects aren’t something Cradle Cincinnati can tackle, Adcock admits—with mostly unknown causes, they’re usually the result of terrible luck. The second issue, sleep-related death (often called Sudden Infant Death Syndrome or SIDS), was among the first broached by Cradle Cincinnati. The organization and its partners pushed out 28 different initiatives around safe sleep in its first year—coaching parents with the ABCs: Babies sleep best Alone on their Backs in a Crib—and saw a 25 percent decrease in sleep-related deaths. Poverty can be one factor here: Imagine living in a one-bedroom apartment without much space or money for a crib. Adcock notes, though, the Cincinnati Health Department will provide free cribs if needed and has distributed more than 1,000 since 2014. Preterm birth is more complicated. Infant mortality related to preterm birth more often occurs in extremely early births, under 28 weeks. If these babies do survive, they spend weeks or months in the NICU. Yet many will die, on average, after two and a half hours of life. While Hamilton County witnesses 100 infant deaths annually, there are 1,200 preterm births locally, according to Cradle Cincinnati. These babies are at higher risk for lifelong health complications, and Adcock estimates that the overall medical cost of preterm births in Hamilton County is $93.6 million annually. Extending pregnancies by just one week for each preterm birth could save $25 million a year. Infant mortality is no easy problem to solve, notes Adcock, in part because “it’s representative of a much larger set of social problems that our society has, so it’s a canary in a coal mine.” The Zip codes with the highest infant mortality rates are also Hamilton County’s poorest. But it’s not just a matter of poverty. “The earlier you are born, the more likely you are to be black,” Adcock explains, and there is no biological health factor to blame here. The economic mobility of African-American families can be limited by a lifetime of systemic racism, and that bias itself could be a factor in preterm birth, as stress impacts mothers’ health. For example, in the six months after September 11, 2001, mothers in the U.S. with Arabic last names had a 34 percent increase in preterm birth. Researchers speculate that increased ethnicity-related stress and discrimination during pregnancy increases the risk of preterm birth or low birth weight. Depending on the study, women experiencing high levels of stress during pregnancy are at between 25 and 60 percent greater risk of preterm birth. One in five new African-American moms in Ohio said they felt emotionally upset as a result of how they were treated based on their race in the year before giving birth. Even among black families with means, there are racial disparities in maternal health. Nationally, an African-American woman with a master’s degree is more likely to have an extreme preterm birth and lose her child than a white woman who didn’t finish middle school. In addition, nationally, black households have the lowest family income by race, and, locally, black children are often born to families of limited means. 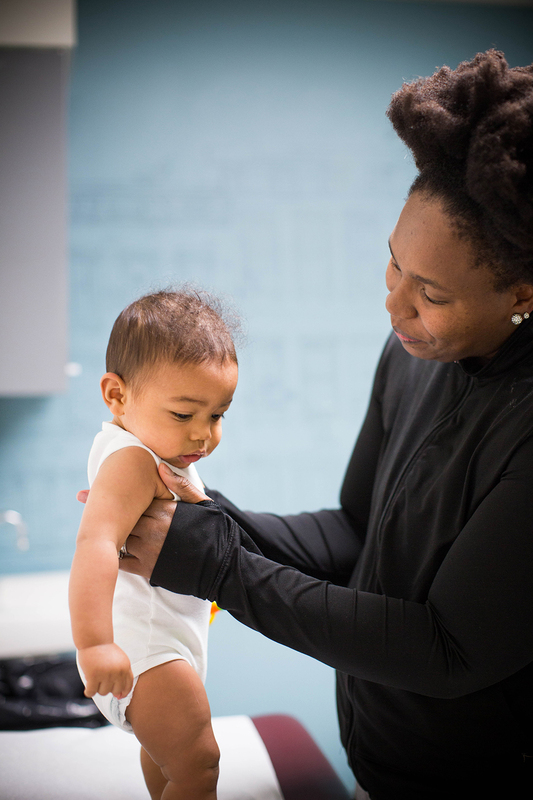 While an imperfect proxy for poverty, according to Hamilton County Public Health’s Division of Epidemiology and Assessment, 78 percent of black children born in Hamilton County in 2016 were covered by Medicaid. Racial inequality impacts the likelihood of poverty. Poverty can impact mothers’ access to healthcare. Living with racism impacts mothers’ health. It’s a cascade. 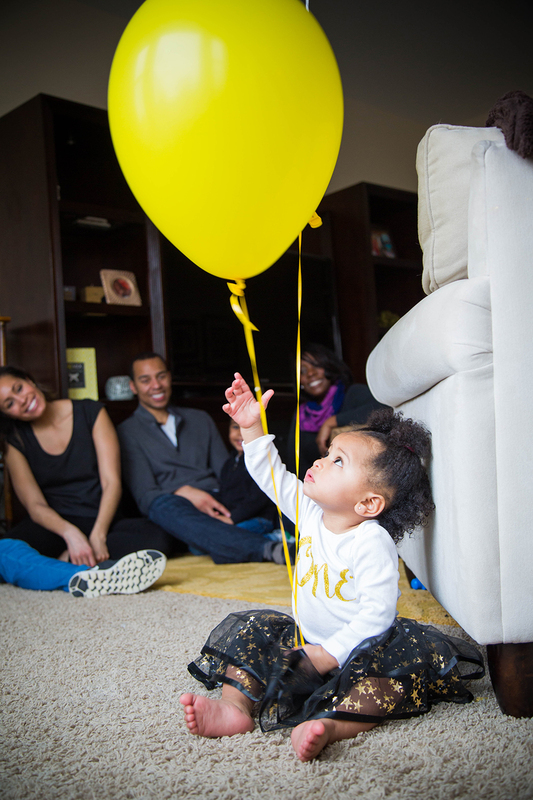 Cradle Cincinnati is working with its Community Advisory Board—including a group of 10 African-American mothers from Zip codes with high infant mortality rates—as well as 25 community health care workers throughout the county who help women navigate the medical system. 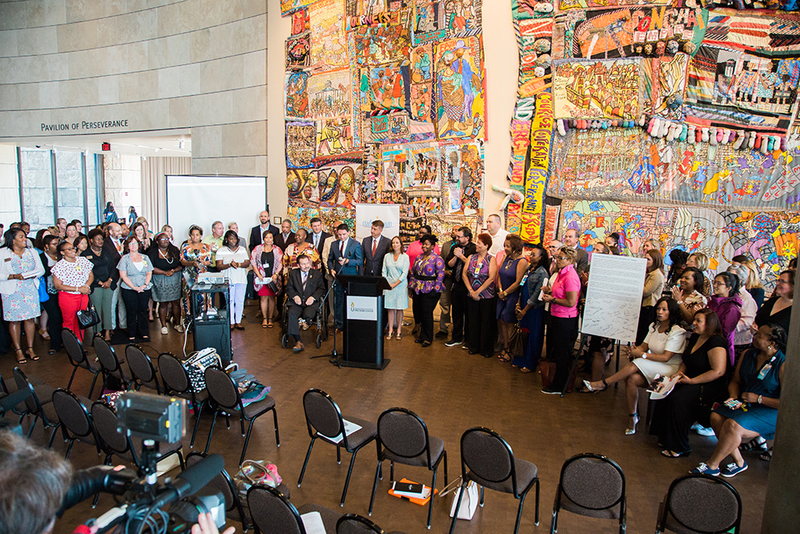 In the next five years, Cradle Cincinnati will organize initiatives for women to work with area prenatal care centers to reveal and begin addressing bias at local maternal health centers. It’s a bold next step. And while it might be difficult to imagine physicians seeking out discussions of their own implicit bias, area health centers helped Cradle Cincinnati develop this strategic plan. “Our community is filled with health care leaders who have said they are ready to lean into the tough stuff,” says Adcock. Positive early results are coming from efforts to engage new parents and children at neighborhood health clinics and at home. I’m on my way to visit Sweet Cheeks, the area’s only diaper bank, at its Republic Street office in the St. Anthony Center. Searching for parking, I end up looping into the edge of redeveloped Over-the-Rhine, where gaggles of young professionals hustle down the sidewalks. There’s a palpable hum of commerce. Crossing back north of Liberty Street, the pace plummets. Clusters of adults gather outside their homes. It’s an unseasonably warm day, and they sit fanning themselves. A few tweens who really ought to be in school cross in front of me. Liberty is a border between the wealth of trendy economic development and the poverty of those who haven’t yet been priced out of their homes. Inside the St. Anthony Center, a shared receptionist leads me to a small office with a desk, a few large sorting tables, and shelves upon shelves of disposable diapers organized by size. Megan Fischer, founder and CEO, has the look of a corporate convert: wavy hair cropped short, carefully applied makeup, professional dress. She’d been firmly entrenched in her career at Cengage Learning, when as a mother to a toddler and pregnant again she saw a story on Facebook about diaper need. She had assumed the cost of diapers was covered by government assistance; it isn’t. Instead, she learned how parents who can’t afford enough diapers often resort to reusing them or simply leaving them on as long as possible. “When a baby’s needs aren’t being met, they will emotionally separate from their caregiver,” Fischer recalls reading, saying she sat crying in her cubicle at work, thinking, “What if I was trying my best, working, trying to make ends meet, and I couldn’t do it? You can’t explain that to a baby.” Another cascade ensues. When most daycare centers require parents to provide 10 diapers minimum a day, a lack of access to them can limit childcare options, which can impact a parent’s ability to get to work. Fischer started Sweet Cheeks Diaper Bank out of her basement in 2015 and quit her job to focus on the organization full-time two years later. The organization now distributes 75,000 diapers each month through 32 local partners such as CityLink, Cradle Cincinnati, First Step Home, Healthy Moms & Babes, and YMCA. Sweet Cheeks estimates there are more than 16,000 local kids experiencing some level of diaper need, and so the organization aims to fill the gap between what families can afford and what they need. Having enough diapers matters, Fischer says, because leaving kids in dirty or reused diapers can lead to serious infections. Young kids can develop UTIs and bladder infections and learn that, when they go to the bathroom, “it hurts.” As a result, parents can rush to potty train—to get out of diapers and because many preschools won’t take kids who aren’t potty trained—and kids can instead fight potty training because they have emotional issues around toileting. It’s stressful even under ideal conditions. Fischer is beginning to distribute potty-training kits (including potty seats, wipes, clean underwear, pull-up training pants, an activity book, and a children’s book). This single need alone can impact low-income kids’ health and emotional well-being and their parents’ ability to hold jobs that help pull them out of poverty. There are so many other needs. “Ninety percent of a child’s brain is developed between the ages of zero to 5, yet traditionally the funding sources for our education begin at K–12,” notes Preschool Promise Executive Director Shiloh Turner. Of course, quality preschool matters greatly to a child’s odds of arriving to kindergarten ready to learn instead of being behind from the start. In 2016, Cincinnati voters passed a property tax levy that includes $15 million annually for Preschool Promise to assist families with preschool tuition. This fall, the organization’s second school year, they’ve enrolled more children than last year and expect the number to keep climbing. “One area where we’re going to continue to expand our enrollment,” says Turner, “is that in the first year of the program we provided tuition assistance to 3- and 4-year-olds who were at or below 200 percent of the federal poverty level.” (Equivalent to $50,200 annually for a family of four.) In year two, Preschool Promise expanded that income eligibility up to 250 percent of the federal poverty level ($62,750 for a family of four). For many families, the cost of preschool or daycare is each month’s highest financial demand. Turner says Preschool Promise is “last dollar in,” meaning tuition assistance through the program doesn’t kick in until after Head Start or public assistance dollars are spent, which spreads more money around to more kids. Another challenge is finding enough high-quality preschools to fulfill what is anticipated to be growing demand by families. Turner estimates there are roughly 9,000 3- and 4-year-olds within the Cincinnati Public Schools footprint but many preschool “quality gaps,” meaning neighborhoods without a certified quality center. In Preschool Promise’s first year, more than half of families reported not having had a quality preschool experience previously. Preschools are deemed “high quality” by the state of Ohio’s five-star rating scale called Step Up to Quality, which will become a requirement by 2020 for centers that receive publicly-funded childcare dollars. Step Up to Quality evaluates a range of factors, including teacher credentialing, curriculum, and number of years of teaching experience. Only centers rated three through five stars are eligible for Preschool Promise tuition assistance. So now the organization is working to bring existing centers up to quality standards. Daddy’s Daycare Child Development Center was founded in the West End by Melena and Dennis Campbell. Dennis attended Taft High School, and as she describes his youthful mindset, “Growing up downtown and going to Taft High School, success was getting out of the hood.” The Campbells each had nice jobs, shared progressively larger homes in the suburbs, but eventually determined their material gain “isn’t success.” Together, the couple felt driven by their faith to start a childcare center in an area similar to where Dennis grew up. Daddy’s Daycare previously had been ranked with one star on the state’s quality standards. “When Cincinnati Public started offering preschool within the actual elementary schools, we saw a huge drop in our numbers,” says Melena. “I went from 24 preschoolers to six.” When she first heard about Preschool Promise, she says, “I didn’t want any part of it.” Yet her staff pushed her to have an open mind, and the promise of learning how to improve their quality rating was enticing. She filled out paperwork, was assigned a coach, and now calls Preschool Promise “a godsend.” The coach helped not only with curriculum and sharpening the center’s educational philosophy, but also on the administrative side, helping Melena earn extra points on her assessment by adding professional development for her teachers. Daddy’s Daycare earned a five-star ranking in June, which made it more than qualified for Preschool Promise funding. Tenia Jones’s daughter is 3 and “into all kinds of crazy things,” including princesses, mermaids, and riding her scooter. She attended Daddy’s Daycare full-time since infancy while her mom, who has a bachelor’s degree in marketing and communication, works in merchandising for Kroger. She earns too much for state preschool vouchers and assistance and became eligible for Preschool Promise only through its qualification expansion. Still, daycare, says Jones, is “ridiculously priced.” Up until August, she paid more for daycare than for her mortgage. With tuition assistance, she now has more money to put toward bills so the family doesn’t fall behind. It’s giving her financial wiggle room. 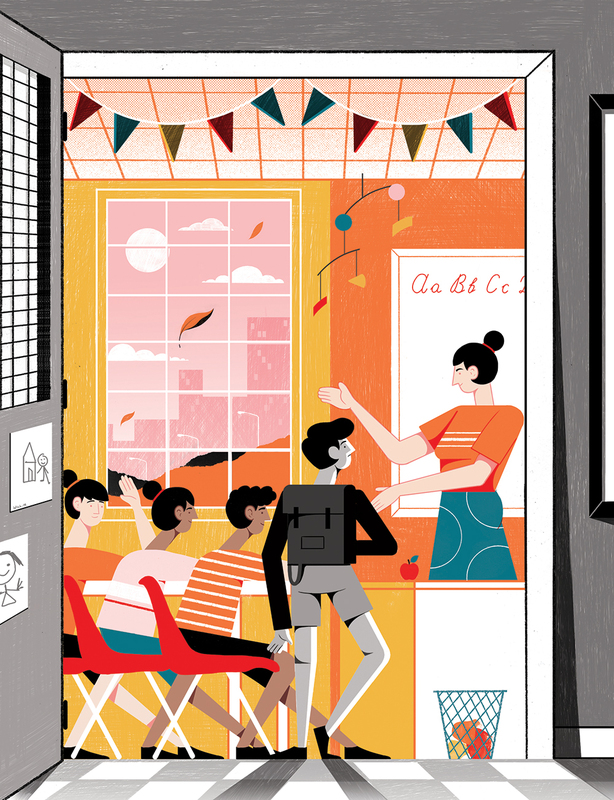 As Preschool Promise helps bring more and more better-prepared low-income children into the city’s school system, it’s fair to ask what happens next. While these children will know their ABCs, shapes, and colors, their home lives remain more complicated than their peers’. Generational poverty creates a nexus of stress that kids feel and that can define entire neighborhoods. In 1999, Cincinnati Public Schools was faced with a state mandate to raise millions of dollars to rehab its facilities in a district that had lost half its enrollment since 1970. “This was a crisis. This wasn’t about poverty. We were all sinking,” remembers Darlene Kamine, executive director of the Community Learning Center Institute. Back then she began asking families, neighborhood by neighborhood, what it would take to keep their kids in Cincinnati Public Schools. She sees most poverty initiatives as spawned by people far removed from who they aim to serve—trying to strategize for “those people”—instead of designing a program or school to which they’d send their own children. At the same time, she recognized that schools aren’t simply a place to hold classes, a place where kids go for set hours each day, but instead a school is a “taxpayer-funded public asset, usually the biggest asset in a neighborhood,” that should be valued by everyone regardless of whether they have children. Over subsequent years, Kamine helped establish six community learning center schools that not only offer classes but house financially independent partner organizations on-site, including health, eye, and vision clinics; housing and employment services; and early childhood learning programs from infancy through pre-K. The health programs accept private insurance and public assistance. Last year, the dental clinic at Oyler School saw almost 500 kids up to age 4 in a Lower Price Hill neighborhood where the only other dental clinic has a four-year wait for new patients. Oyler’s eye clinic identified 68 percent of children it saw between ages 3 and 19 as needing glasses. It’s a resource for everyone by design, says Kamine. The schools host neighborhood events like barbecues and puppet shows to draw in community members whose kids aren’t school-aged or who don’t have children. While considerable effort had been put into building the schools into community hubs, kids were still arriving in kindergarten behind. “How do we level the playing field again?” Kamine asked herself, and after lengthy research to ensure they wouldn’t be bumping off any neighborhood care centers, she began a partnership with Patti Gleason, president of Cincinnati Early Learning Centers, to develop year-round, full-day early learning centers in the schools. The five-star rated programs graduate preschoolers who score a minimum of 20 percent higher than average in readiness, and 85 percent of its kindergarteners are on track for first grade. On the edge of Findlay Market is a building that houses Buddy LaRosa’s boxing gym downstairs. Community Outreach Advocates is upstairs, part of the multi-agency collaboration formed by the Cincinnati Initiative to Reduce Violence (CIRV) and Cincinnati’s Office of Human Relations. Outside along the sidewalk and against a spindly tree sits a large, weather-beaten teddy bear memorial topped with deflated helium balloons, an overturned coffee mug, a liquor bottle, a fresh loaf of bread, and flowers. Community Outreach Advocates started after the city’s 2001 riots as an attempt at peace-keeping after police-related shootings and today is tasked with performing street outreach following shootings and homicides. For the 13 Community Outreach Advocates, their territory is divided into the city’s five police districts, with all staff on call 24/7, so when there’s a shooting in the city one or more will respond within their assigned district. “Pretty much all of us, we know people on the streets,” explains Pastor Jackie Jackson, District 3 North Coordinator, “because at one time or another we’ve been in the streets.” That connection gives the group credibility. Jackson estimates that nine out of 10 times at least one advocate knows someone at the scene, often the victim or family of the victim. The team isn’t there to arrest or investigate, but instead to help with crowd control and conflict mediation and to work as a go-between for the police and community. Jackson himself was shot in the hand when he was 10; the bullet exited and entered his friend’s torso. His oldest son was shot and survived. In the past four years, 10 people shot or murdered in the city have been his family members. If you look at a list of shooting locations in Cincinnati in 2018, certain neighborhoods repeat: Price Hill, Avondale, West End. The ages of victims between January and August this year averaged 29 years old, with three age 1 or under. Jackson believes the atmosphere on the streets has changed since he was growing up. He warns me there are “dope boys” within blocks of the rec center. There aren’t enough activities, options in the arts, or free sports for kids, and as an alternative they often “hang out in the street.” He remembers drug dealers ran children off when he was a kid. “Now they recruit them” to run pickups as young as age 8. For a kid who doesn’t have much, Jackson says, having someone who makes sure you eat or have sneakers has a certain appeal. Kids become easy prey or get swept up in something more complicated than they can possibly understand. This is one of many reasons, in addition to responding to shootings, why Community Outreach Advocates work to show young people that other possibilities do exist. They introduce kids to police outside of the stress of street activity, for instance. Jackson recounts one Oyler School student saying a friendly school visit by some officers was the first time he’d ever interacted with police other than seeing them arrest someone. Advocates also take kids on field trips and visits to local universities. On a recent trip to the University of Louisville, one young man from Price Hill asked, after the bus crossed the bridge into Kentucky, if they were still in Cincinnati. He’d never been out of the city. The goal is to “give the kids a different outlook,” says Jackson, “a different environment” to show them the shape of a world they simply don’t know otherwise. They see what it might mean to get out. Cincinnati is fortunate to have layer upon layer of people and organizations working to help kids made vulnerable because of family economic factors they can’t control. But in a city with so much childhood poverty, it’s clear that more layers of help are needed. There’s something about kids, wiggling around together in preschool, bounding off to class on a birthday, or chattering on their way to the bus. Their young lives are full of possibilities. Maybe that’s one of the reasons adults love asking kids, “What do you want to be when you grow up?” We like to believe the answer could be nearly anything. But consider again the factors that impact impoverished kids: limited access to quality education, neighborhood violence, unstable housing, inadequate food, stress, not enough diapers, and babies with decreased odds of survival from birth. These are all factors over which our children have no control, and all factors that place limits on their potential. In too many cases, it’s not “when you grow up,” but if. And that’s a fate no Cincinnati child deserves in 2018, no matter his or her Zip code.